Day 3 was a unique fishing day for me. We went to the Bocas in a larger boat with a 9.9 Yamaha outboard to try fishing in amongst the channels between mangrove islands. Occasionally they tow the smaller flats boats out. Water flows through these channels in the mangrove islands like a river due to the action of currents and tides. Beautiful to visit and I will go back again. 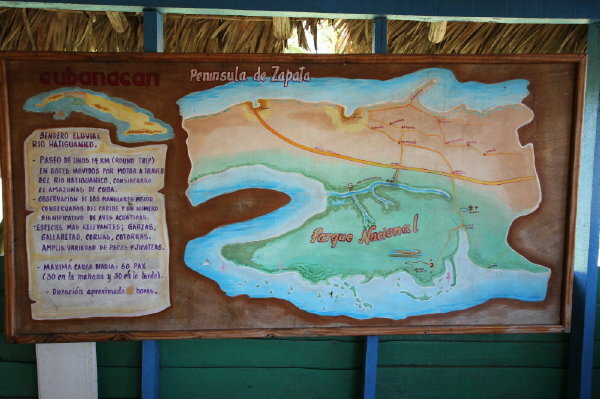 It was here that I started stalking the illusive tarpon in the back channels and under the mangroves. This was the craziest type of fishing. 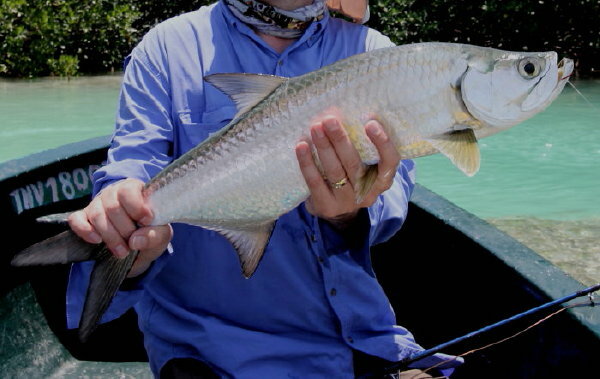 I saw a respectable number of tarpon some swimming in schools in narrow channels and some tucked far back upon inside the mangrove roots. Some tarpon were in groups as big as 20 individuals, other smaller groups of 3-6 and some singles. After about 14 shoots numerous casts, 7 attacks I finally ended up catching 1 tarpon and losing 6. Sight fishing for tarpon was breathtaking. So WOW! Nothing can beat it. As part of the journey this day I also caught 1 bone on the way out and caught 7 bones on the way back. There were waves of bones passing by like day 2 on the path home. Sight fishing to single and multiple tarpon is like nothing you have ever seen in Canada. These fish make you heart not only skip a beat but just jump out of your chest. The camouflage scales on the bones are cool and the tarpon I am just in total awe of. The level of excitement and adrenaline is incredibly addicting. I would definitely be back to do this again. Day 4 of fishing was again unique. Today we went to a cool river to try fresh water baby tarpon. There were 8 of us out on the river and one was spinner fishing. The spinner fisherman had zero attacks as did 4 fly fishermen. One fly fisherman had 3 attacks and 2 had one attack each. I had an awesome 7 jumped tarpon along with multiple unseen attacks and landed 1 tarpon. They are such skilled jumpers I was happy to catch one. One fellow on the trip caught a catfish and did not take a photo. Strangely enough I tried to catch a catfish and they would not bite. 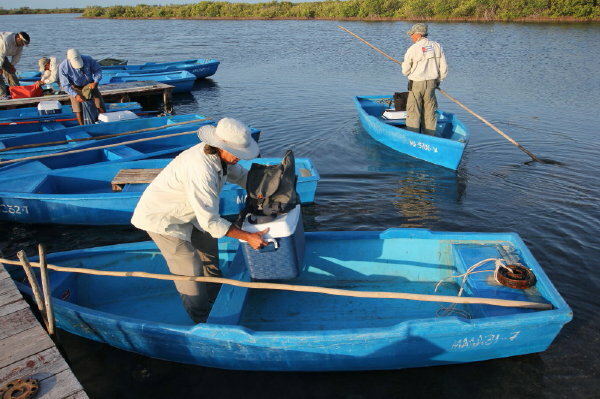 I heard the catfish are introduced from China so I hope the Cubans did not make a fatal environmental mistake for the sake of a potential food source. It was truly an amazing river. There were tarpon jumping all around when we arrived at a side channel. Within two casts I was getting bites. When the tarpon struck you got an incredible fight or flight feeling. They are so strong. Each one capable of making you hold on tight to your rod for fear of it getting ripped from your grasp. The tarpon strike with wild abandon at times and repeated strikes on one retrieve was common early on. By retrieving quickly they must decide fast to eat or not. Casting into the edge of mangrove oblivion tests your skill at fast response hook sets. You need to set the hook immediately then again and again like you like depended on it. It is hard to know thinking as a trout fisherman how hard to strike when attacked and all I can say it 10 times harder than you think. At the same time they often were still charging towards the boat taking their attacking momentum with them and then jumping with wild abandon. Needless to say? 6 were far the better warrior this day. They feed and survive deep in the mangroves and you need them out where you won't lose fly line. Once they strike you need to set really hard and hold tight and strip, strip, strip till they cannot get back to the mangrove entanglement. Then hold on even tighter as they explode to the sky to shake the hook. Most of my tarpon seemed to jump towards the boat as I tried to set the hook until you just saw the fly shake loose. Each jump as strong and terrifying as the last as often you hear the sad sign of the guide as the fish escapes another photo. 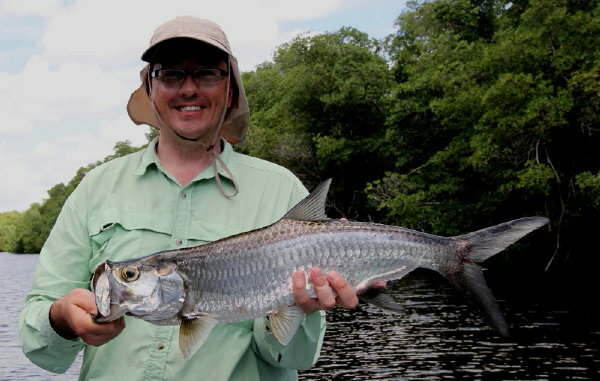 If Lady Luck and tons of skill pays off you can land a tarpon. Some brag of size. Some brag of numbers and to me on this trip it does not matter. Landing one is like catching the winning touchdown on the last out of the game at the Super Bowl or scoring the game winning goal in game seven of the Stanley Cup. The feeling of immense satisfaction is equally present as so many factors must line up precisely. Fishing for tarpon was amazing. I did not figure I would get one first time out. Fortunately I had so many chances I was able to land 2. This trip in so many aspects definitely exceeded my expectations. Day 5 concluded a great trip with nice, respectable day fishing in which I caught 18 bones, 1 jack, 3 cudas and 4 red snapper. Flats were calmer and the bones seemed more skittish. 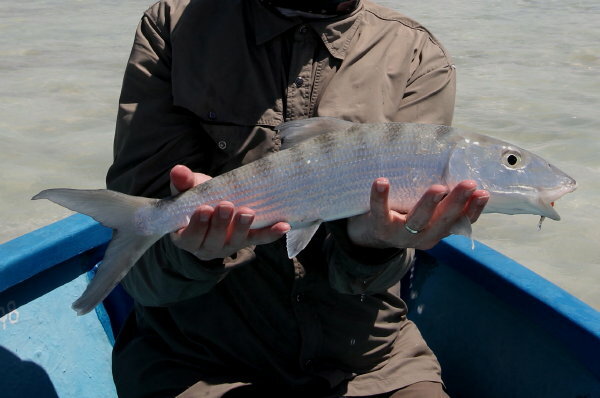 Still seeing groups of hundreds of bonefish feeding is amazing to witness. They often look like they are lounging on the surface sun tanning as they slurp larvae just below the surface. Today I soaked it all in. We saw a school of bones mudding in deeper water and wondered if a permit was in the mix. I caught 6 bones before breaking off twice then landing a small jack. Not sure what the bigger fish was but that is why I was casting there? because you never know what might be lurking! Finished the day off with some mojitos and bought some traditional Cuban money from an expat Canadian dating a Cuban woman. He said Cuban on Cuban crime is bad. He said there are lots of robberies on regular Cubans. No physical violent but rather stealing stuff. More stuff in the country would lead to more crime. Or one could take the opposite point and say if there was more wealth there would be less crime. Cuba is a sharp contrast between expectations and observations. While on one hand they don't make much money they also seem to have enough to eat. Cubans definitely lack in material possessions and yet excel at family time. Watching the local community interacting with one another they are polite and friendly and very family orientated. All staff we dealt with were helpful, courteous and accommodating. Cuba does seem to lack pride in a clean country. Garbage and litter is all around except in resort areas. Stray dogs roam all around un-spade and un-neutered while clearly fed and somehow looked after. Oxen and horses are used as work animals and cattle also as food and looked poorly fed and under nourished. There is clearly a lack of food of any quality for the livestock as you can see ribs poking out unless this is breed specific. Likely this is due to extremely rocky ground lacking is topsoil of any significant compounded with the embargo that contributes to lack of agricultural infrastructure such as irrigation. 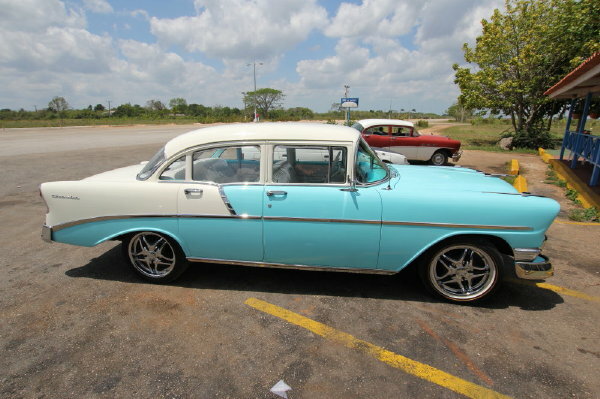 Old 50's classic cars abound with many held together with grit and perseverance while others are in pristine shape. There are also a few expensive new vehicles. Not sure who owns them. There are also a lot of other foreign vehicles. I saw a few Italian cars, a few Russian cars a lot of Chinese cars. The tour buses seem to be mostly Chinese in origin. There are millions of bikes in Cuba. Given the income level it would be interesting to see how they pay for replacement tubes/tires. Many cars/trucks had bald tires and I mean smooth as glass. Tires might as well if been racing slicks. Still there are many bikes and also still many walking. Public transportation is a combination of buses, hitch hiking, bikes, walking and occasionally personal vehicles. Hitch hiking seems a local standard method of travel. Pointy finger stretched out seems to be universal. People also hold out money and normally national currency. People get rides in cars, taxis, trucks, backs of trucks, back of dump trucks and produce trucks. Then there are horse drawn buggies, bicycle taxis, motorcycle buggy taxis. Public buses can go from rusted out junk piles in wheels in remote non tourist areas to more newer modern buses. Yellow school buses are also seen ferrying kids around. Kids look very keen for school all dressed up in their uniforms. Boys and girls all wear the same colors. Sadly I eventually had to leave Cuba. 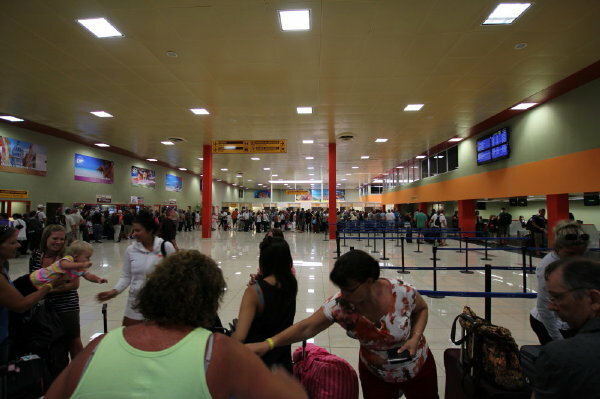 Varadero airport is chaos in motion. It seems they have planes arrive and depart in bunches. This means short period long line ups. First to get your boarding pass (remember to have your departure tourist visa with you as well as passport. Then you need to cue for paying the $25 CUC departure tax. A sticker gets added to your ticket. Then you cue in the customs and immigration line. They retake everyone's photo... Likely to make sure a Cuban is not trying to leave using your passport. Then you line up for the security screening then to line up to buy Havana Club rum. Next line up for food... then bathroom... then money exchange (yes there is one in the departure area)? then departure cue and you are flying home. Humidity and heat in the terminal building is tolerable with poor air conditioning. Just before the plane departed I noticed a funny thing at the Varadero airport. Right at noon all the staff stopped working and turned off the main lights in the departure processing area then went for lunch. Everyone! Oh well. Next line up will be your local airport and for me that was Canadian immigration and customs. Special thanks to Slipstream Angling Worldwide for organizing a great trip. Accommodation was good, transportation was great and the trip host was excellent. Guides were awesome and the fish were very cooperative. I will go back again for sure!